The trial of Michael Jackson's doctor has opened, with prosecutors claiming he is guilty of manslaughter and "gross negligence" over the star's death from a drug overdose two years ago. Opening the trial this afternoon, prosecutor David Walgren played jurors a recording made on 10 May 2009 of an apparently intoxicated Michael Jackson. Jackson's doctor, Conrad Murray, is accused of administering a fatal dose of a powerful sedative to Jackson. Murray's defence is expected to argue that Jackson killed himself by taking an extra dose while the doctor was out of the room. "The evidence... will show that Michael Jackson literally put his life in the hands of Conrad Murray," Walgren told the court in his opening statement, adding: "That misplaced trust... cost Michael Jackson his life." "What we expect the evidence to show is that Conrad Murray repeatedly acted with gross negligence, repeatedly denied care appropriate care to his patient, Michael Jackson," he told the court in downtown Los Angeles. Jackson's mother Katherine and father Joe were in court, along with his siblings Jermaine, Janet, LaToya, Randy, Tito and Rebbie, while Conrad Murray appeared grave and serious as he entered the room. At least 300 fans and others lined up outside the court, some chanting "Michael, Michael" before the trial started. Dr Murray, 58, faces up to four years in jail if convicted by a jury of seven men and five women of involuntary manslaughter for Jackson's death on June 25, 2009, as the 50-year-old star was preparing for a series of comeback concerts. Even before the trial started, some Jackson fans were saying Dr Murray should face a more serious charge. 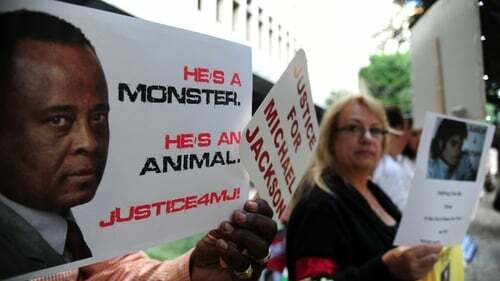 "He should have been charged with second degree murder," said Erin Jacobs, head of the organization "Justice4mj," 10 of whose members were outside court in black tee-shirts bearing their group's name. The first witness expected to be called was Kenny Ortega, the producer of Jackson's "This Is It" shows - clips of which may also be played in court during the trial. Dr Murray is accused of giving Jackson an overdose of the powerful sedative propofol - which Jackson himself referred to as "milk" - to help alleviate his insomnia at a rented estate in the posh Holmby Hills neighbourhood of LA. Dr Murray, trained as a cardiologist, has never denied giving Jackson propofol, which typically is used as an anesthetic during surgery, but he denies allegations that he "abandoned his patient" at a critical, and ultimately fatal, moment. His lawyer Ed Chernoff is expected to argue that the world-famous "Thriller" singer, desperate for sleep, administered more of the drug himself while Murray was out of the room. The panel to decide Dr Murray's fate includes six white jurors, five Hispanics and one African American. They include high school graduates, some jurors with a college education, and one with a masters in business. Half of the panel's members are Jackson fans - a 54-year-old juror wrote that she "loved his music as a very young girl, as an adult not so much" - while one juror, a cartoon animator, once met Mr Jackson. The trial originally was to have started in March, but was delayed twice. In that time the judge rejected a string of requests, notably to let Mr Jackson's former doctors testify, in what the defence hoped would prove he was a drug addict. On the eve of the trial, the judge ruled that footage of Jackson announcing the London comeback shows cannot be shown in court. Dr Murray's defence lawyers claimed the footage showed Jackson already under the influence of drugs and hence out of control, but prosecutors said the footage was "absolutely irrelevant" and the judge agreed.